a small Azure Linux VM to use as a bastion host (to access cluster nodes via SSH). The Azure SQL database is private and only accessible via a database service endpoint from the Confluence application nodes. The application gateway acts as load balancer for your scale set of Confluence nodes and web application firewall. We use a storage account for Confluence's shared home directory. It's mounted on each Confluence node, and treated as any other file store would be. Synchrony will be managed by Confluence (on Confluence nodes). This means you don't need to provision or configure anything to be able to enable collaborative editing. You can't use the deployment template to upgrade an existing Confluence deployment, or to provision new nodes running a different version to the rest of your cluster. Before you begin, you should use the Confluence Data Center load profiles to determine the size of your site. This information will help you choose the right infrastructure size during deployment. You should also decide which Azure region is best for your site. Some services, such as such as Application Insights and Azure SQL Analytics, may not be available in all regions. You can check this at https://azure.microsoft.com/en-gb/global-infrastructure/regions/. Your database details, if you want to use an existing Azure database service. You'll need the database URL, port, username, and password. A Base64 encoded PFX certificate from a trusted Certificate Authority. Details of your existing CNAME, if you don't want Azure to generate a random domain for you. To migrate, you will need to set up a new Confluence Data Center site in Azure, and then import content from your old site. This approach ensures that your new site is created with optimum settings for Azure. Back up your existing site, including your database and home directories. Perform a full site export, excluding attachments if you have a large site. You can also turn on read-only mode, to prevent users from making changes in your old site. Deploy Confluence Data Center in Azure via the Azure Portal, or CLI, and test that Confluence is working as expected. Import your site export file. Make sure you know the administrator password for your existing site, as you'll be logged out during the import. Copy the contents of your /attachments directory to the equivalent directory in your shared home. At this point you can make the site available to your users, and tear down your old site. Do a trial run first - export your existing site, and import it into Azure to iron out any issues. Because you're setting up your new site in parallel, your current Confluence site can remain accessible throughout the process. If you're already running Confluence Data Center, use read-only mode to prevent people making changes after you've exported the site. Unless your existing site is small, exporting the site without attachments will keep the export file smaller. Once deployment is complete, go to the Confluence URL (APPENDPOINT) listed in the deployment outputs to complete onboarding and start using Confluence. Confluence バージョン Specify the version of Confluence you'd like to install in full. For example 6.14.0. Head to Confluence Release Notes for a list of all releases. Select the expected size of your site - trial, small, medium, large, extra large. This will determine the number of Confluence application nodes, and the size of VMs to be provisioned. Choose Change Size to override the defaults. データベース タイプ Choose either a SQL Server or PostgreSQL database. If you have an existing database in the same location and resource group, you can choose to use your existing database, and enter its details here. Provide an SSH public key to be used to SSH into the instance that will act as bastion host, and a username and password for SSH access to the Confluence nodes. See Create and use an SSH public-private key pair for Linux VMs in Azure in the Microsoft Azure documentation. HTTP/SSL Provide the certificate and password to be used for SSL termination on the Azure Application Gateway. 監視 Choose the monitoring and analytics services that you would like to enable. Subject to availability in your location. Using the deployment templates directly allows for greater configuration granularity. All hardware choices such as the number of cluster nodes, size, disk size, and OS type are configurable as parameters. Head to https://bitbucket.org/atlassian/atlassian-azure-deployment and check out the README to find out how to to deploy using the CLI. If set, all further Gateway, VM, DB size parameters will be ignored. This is the SSH password you'll use to access your Confluence nodes. The following parameters are optional. If you don't provide a value in the parameter file, we'll use the default values listed below. This is the version of Confluence you want to install on your cluster nodes. Enter the Confluence version number in full, for example "6.14.0". We don't recommend using versions prior to 6.12, as they don't support managed Synchrony. Use this URL to override standard Atlassian download url, for example to specify beta, release candidate or EAP versions. Used in conjunction with the confluenceVersion parameter. Create a new database or attempt to use an existing specified database. Note that this has to be in same resource group and location as the target deployment. Azure SQL DB Choose between Azure SQL Server and Azure DB for PostgreSQL. dbHost auto-generated The hostname of database server to be used if an external database is being used. This will be autogenerated if a new database is to be created. dbPort 1433 The database port to use if an external database is being used. This will be autogenerated if a new database is to be created. dbDatabase confdatabase The database name to use if an external database is being used. This will be autogenerated if a new database is to be created. dbSchema auto-generated The database schema to use if an external database is being used. This will be autogenerated if a new database is to be created. dbUsername confluencedbuser The username for the dedicated database user. This is the Canonical Name record (CNAME) for your organization. If you don't provide one, Azure will generate a random domain. If you do use a custom domain, you must also update your Domain Registrar's settings to add the Azure DNS Name Servers. Consult your domain registry's documentation on how to configure cname records. The certificate to be used for SSL termination on the Azure Application Gateway. The certificate password to be used for SSL termination on the Azure Application Gateway. 管理 The username for the Confluence Administrator's account. Must be lowercase. Admin Admin The full name of the Confluence Administrator's account. confAdminUserEmail admin@example.com The email address of the Confluence Administrator user. confAppTitle Atlassian Confluence The name of your Confluence site. jumpboxSshUser confluenceadmin This is the SSH user you'll use to access the bastion host (jumpbox). clusterSshUser confluenceadmin The SSH username to use to access the Confluence nodes from the bastion host (jumpbox). This is the only way you can access Confluence nodes. enableEmailAlerts true Enable email alerts. enableApplicationInsights true Enable Azure Application Insights. true Enable Azure Operational Insights. The confClusterSize parameter allows you to select the size of your deployment, and then use our recommendations for all resources to be created. If you choose not to set the confClusterSize parameter, you can choose to define your own values for things like dbTier, dbTierSize, clusterVmSize, LinuxOsType, and appGtwyTier. These parameters are all listed in the azuredeploy.json template file, with a description and allowed values. You should also check out the Developing guide in the template repository to learn more about developing your own template. We recommend deploying Confluence with SSL. Our template will prompt you for a certificate and password. HTTPS is terminated at the application gateway. Your certificate should be from a trusted Certificate Authority. You should avoid self-signed certificates. A number of default alerts are available, such as cluster nodes going offline, CPU, or Db DTU exceeding 80%. These alerts will be emailed to the Confluence Administrator email address specified in the deployment. Application Insights can be used to see the overall system health, and dig into particular areas of interest Application Insights in the Azure documentation. Azure SQL Analytics is available for more granular monitoring of your SQL Server database. 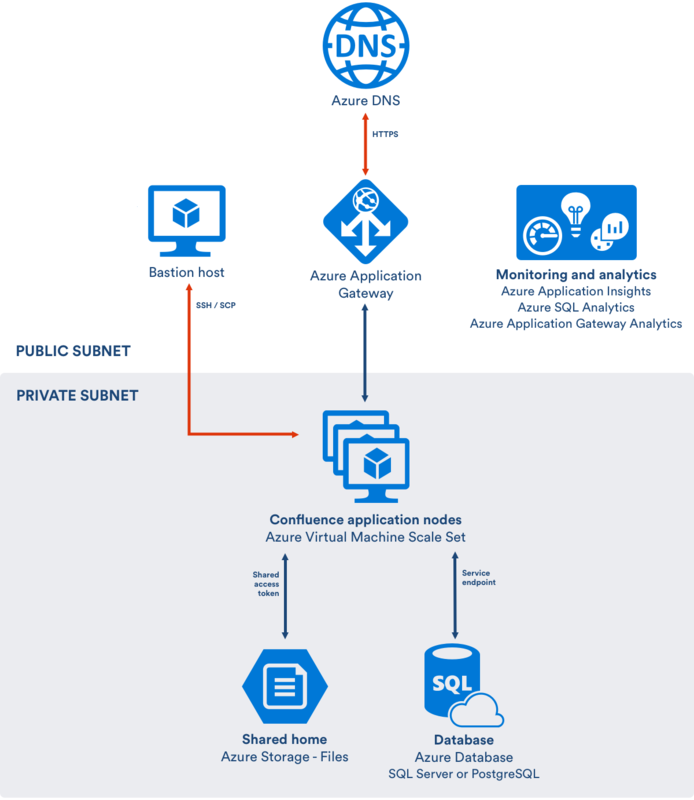 Monitor Azure SQL Database using Azure SQL Analytics in the Microsoft Azure documentation. Note that some of these resources are still in Preview, so may not be available in your location yet.